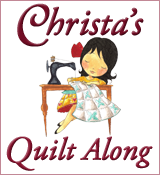 When I heard about the Stitch Me Up Blog Hop, I signed right up. I knew it was the challenge I needed to encourage me to learn how to embroider. As soon as I saw this pretty lady, I knew she would be my first project. She reminds me of my Mom. I attempted several stitches on this piece; back stitch, french knot, basic buttonhole stitch, double blanket stretch, coral stitch and squared laid work (variation 2 according to my embroidery book). I then turned her into a table topper for my pretty Ackfeld frame. I hope you like her. My next project was to add an embroidered outline to my Nancy Drew wallet from the last blog hop. It really helps Nancy stand out. 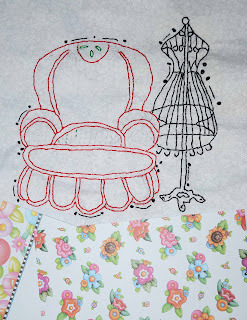 I loved the Nana's chair pattern and wanted to make it as a mini quilt for the door to my sewing room. The pattern reminded me of Mary Engelbreit fabric. I first had to reduce the size of the pattern as the Ackfeld hanger I have for over the door holds a 6 inch mini quilt. I did not get a chance to finish it as my granddaughter came to visit for spring break and we had such fun traveling around sightseeing that I ran out of time. I did want to show my partially finished project with some M. E. that inspired my color selections. The chair will be filled with stars and M.E. inspired flowers. Wonderful stitchery projects! Thank you for sharing. Oh you did wonderful on your stitching...thanks for joining in. Great job on your projects! Wow! You've certainly stitched up some lovely projects! You are well on your way...looking forward to seeing your second 'go' at embroidery :) Thanks for sharing! Love your lady! And the chair is wonderful too! Wonderful stitching. You did a lot of work. Beautiful stitching! I love them all. Thanks for sharing your lovely work. Your projects are really lovely. Thanks for sharing them with us. PS. I really love your tea pot! Great stitching! I especially like the first one. 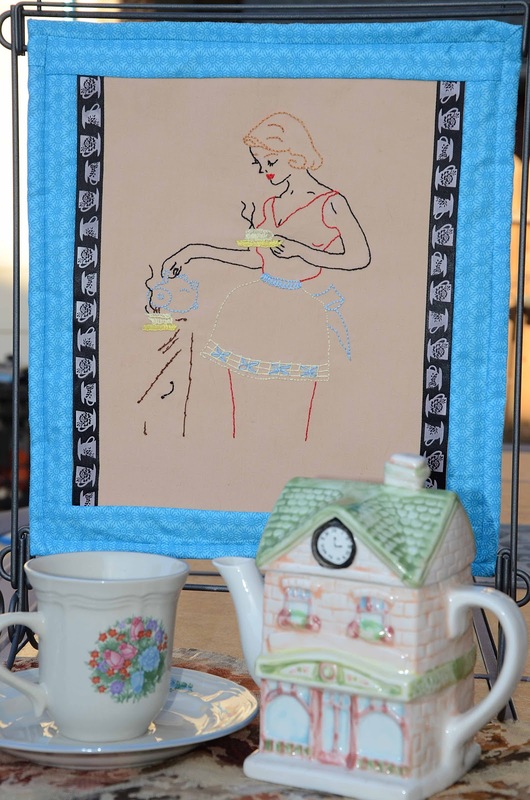 I liked your table topper framed in the blue fabric. The chair is lovely also. 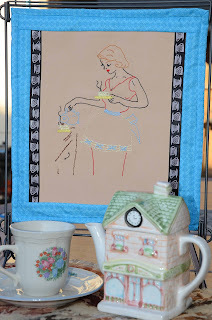 Beautiful stitching and what a great idea to display them in your hanger! I love "your mam"! She looks great and colorfull. The Nancy Drew is cute and the chair is beautiful, thanks for sharing! Lovely stitching! Thanks for sharing! Lovely tribute to your mom by using Mdm Samm's design! 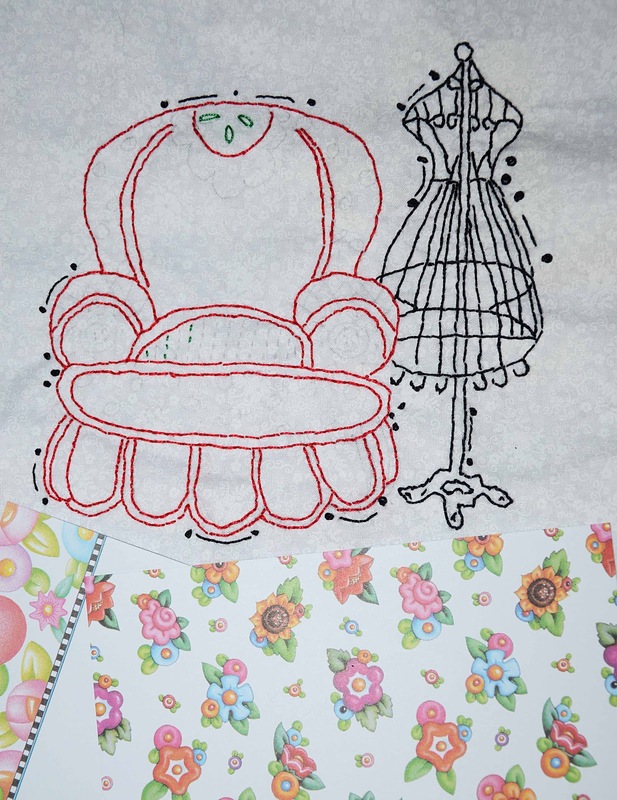 Mary Engelbreit and Debbie's comfy chair design are a perfect go-together so your project should be wonderful once complete. Your projects are so pretty! Great job! Great work. And having fun with granddaughters always goes first. I love your work. and I agree it does look like a M.E. chair, you have picked the perfect fabric. Having fun with your granddaughter is so important. Thank you for posting and sharing. I do like your mini quilt. You have been busy with some great projects. Lovely work. Granddaughter time is so special--I'm glad you got to spend time with yours! Grandchildren are awesome, so spending time with the granddaughter is definitely allowed. Lovely job on your projects. I love the smaller quilts they fit on a wall like a picture then...LOL you did a great job! Beautiful stitching! Your projects are all lovely. Good morning.Thanks for shareing your projects. Have a wonderful Easter weekend. Your lady is pretty. Great idea for the Nancy Drew wallet and I just love everyone's take on the chair. Would love to see yours when it is finished! Wonderful work! I really like how your projects turned out! How sweet all of your projects are. You did a lovely job and Thanks for sharing. Great stitching projects! I love how you went back and embelished Nancy Drew. Thanks for sharing! Great projects and you did wonderful. Beautiful work! It's coming along nicely. Thanks for sharing with us. You've learned a lot! All three projects look lovely. I like that you added some outlining to your Nancy Drew project....good idea. Nice work. A granddaughter visit is always more valuable! Wonderful stitching. Your mini quilt is adorable. Yes, stitching sometimes really 'makes' a piece. Looks like you enjoying all your stitching. The M.E. chair will be as sweet as the M.E. fabric. Such nice work! Thank you for sharing your projects with us. I love all your projects and your teapot too! And spending time with your granddaughter is much more important than a finished project. You did a terrific job on all of your projects. great projects! You did a wonderful job! Thanks for sharing! Wow! For just learning to embroider you've done an incredible job! And I can't believe how many stitches you've used! Good work! You did a great job. I love that Nancy Drew fabric and any M.E.! Thanks for sharing! Nice projects. You are well on your way! Love what you did with the Nancy Drew silhouette. Private Duty Nurse, currently pediatric. Certified Scrapbook Instructor. Cardmaker,and Wantobe Quilter. 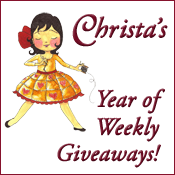 Nancy Drew Blog Hop Starts NOW!